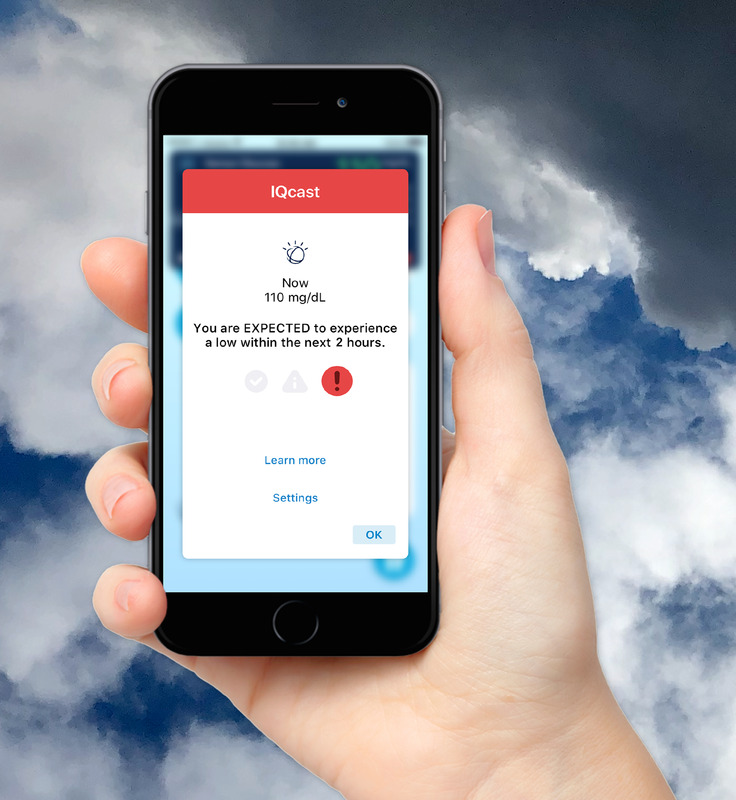 "Simply put, IQcast acts like a weather forecast for people with diabetes so they can better prepare for their day," said Dr. Robert Vigersky, senior director, Medical & Clinical Affairs for Diabetes Group at Medtronic. "By predicting the likelihood of a low glucose event from anywhere between 1 and 4 hours in advance, IQcast empowers people on multiple daily injections (MDI) with insights so they can live their life with greater freedom and better health." "Hypoglycemia, or 'going low', is one of the most acute and frightening events that a person living with diabetes can experience," said Dr. Lisa Latts, deputy chief health officer, IBM Watson Health. "Fueled by the right data, AI and machine learning can play a powerful role in helping to alleviate the burden of diabetes and the worry of a hypoglycemic event, and we've built the new IQcast features with this goal in mind." Medtronic and IBM Watson Health leveraged their combined expertise in diabetes, AI and analytics to develop the IQcast feature as part of the Sugar.IQ personal diabetes assistant app. Both companies have been dedicated to advancing the science behind predicting potential hypoglycemia since the beginning of the partnership. The IQcast feature analyzes multiple signals to assess whether someone with diabetes has a low, medium, or high likelihood of going low over the next 1-4 hours. The degree of predictive accuracy that IQcast is able to achieve increases as a low blood sugar1 event becomes more imminent. The Sugar.IQ assistant reveals patterns that may be hard to see so that someone with diabetes gains meaningful, personalized insights. These insights show people using MDI how lifestyle choices impact their diabetes management and their time spent with glucose in the target range (70-180 mg/dL). The app uses AI and advanced analytics to give users a full picture of their current levels and provides individualized guidance in understanding and managing daily diabetes management decisions2, so that people on MDI have more freedom to enjoy life. The Sugar.IQ app is available to users of the Medtronic Guardian(TM) Connect system, the first smart standalone CGM system3 designed to empower people with diabetes using MDI with actionable tools to help them get ahead of low and high glucose levels - not just react to them. With customized predictive alerts in the Guardian Connect system up to 60 minutes before a low or high event3 and within a one to four hour window before a low event withthe Sugar.IQ assistant, Medtronic provides people with more tools to help them stay in range than any other CGM system4. As presented at the American Diabetes Association Scientific Sessions (2017, 2018), when using both the Guardian Connect smart CGM system in conjunction with the Sugar.IQ app, users have shown the ability to achieve an extra 36 minutes per day in a healthy glucose range of 70-180 mg/dL, including 30 minutes less time in hyperglycemia and 6 less minutes in hypoglycemia5. 1 Low blood sugar or hypoglycemia is defined as a blood sugar less than 70 mg/dL as defined by the American Diabetes Association (http://www.diabetes.org/newsroom/press-releases/2016/ada-issues-hypoglycemia-position-statement.html). 2Decision-making around insulin dosages should always follow the guidance of a patient's healthcare professional. The system is intended to compliment, not replace, information obtained from standard blood glucose monitoring devices. All therapy adjustments should be based on measurements obtained from standard blood glucose monitoring devices and not on values provided by the system. 3Using Guardian Sensor 3, the Guardian Connect system was proven in a clinical study to accurately alert patients of 98.5 percent of hypoglycemic events. Guardian Connect system Instructions for Use (IFU): with a sensor glucose limit of 70 mg/dL, with calibration every 12 hours, both predictive and threshold alerts "On," within 30 minutes; abdomen sensor insertion. The correct detection rate for arm inserted sensor is 96.7 percent; with the same settings and conditions. 5Clinical observationsfindings presented at the 2017 and 2018 American Diabetes Association 78th Scientific Sessions (2018: https://plan.core-apps.com/tristar_ada18/abstract/807d2f9885450670bb994661e35f8126; 2017: http://www.abstractsonline.com/pp8/#!/4297/presentation/45397).